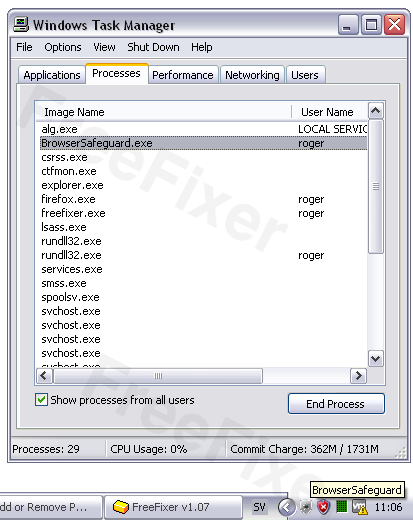 Do you see an icon labelled Browser Safeguard in the system tray and BrowserSafeguard.exe running in the Windows Task Manager? Furthermore, you understand and agree that: .. some services and/or software provided by Browser Safeguard contain advertising. Additionally, we may supply advertising from time to time on websites that you visit. Under normal circumstances I usually show how to remove software with FreeFixer, but since Browser Safeguard modifies your computer’s proxy settings I think it’s better to let it handle the uninstall process. FreeFixer does not have any “restore proxy settings” feature, but that is certainly something that I should add. Please let me know if you have lost your Internet access after removing BrowserSafeguard.exe manually. I’ll post some instructions here on how to restore Internet proxy settings. Back in July I was first notified about the eGdpSvc.exe file. At that time, only one of the 45 engines at VirusTotal detected the file and I didn’t know how it was distributed or how it ended up and the users’ machines. Today, I noticed that eGdpSvc.exe is still distributed so I thought I’d make a quick uninstall guide that shows how to delete eGdpSvc.exe with the help of FreeFixer. This video also shows that the “more info” links in FreeFixer can be quite useful to determine if a file is legitimate or malware. When looking at the “more info” page of eGdpSvc.exe in the video you’ll see that eGdpSvc.exe is currently detected by 14 of the anti-virus scanners at VirusTotal. Do you click on the more info links while trying to determine if a files is legitimate or malware? Then you’ve got the “Nav-Links” (nav-links.com & intext.nav-links.com) software installed on your machine. Nav-Links are integrated into many web browser extensions. Here’s a step-by-step guide on how to remove the Nav-Links. Find a web page where the Nav-Links are shown. Disable all web browser extensions and verify that the Nav-Links no longer appear. Enable the extensions one by one and restart the browser, until you find which extension that contains the Nav-Links. In my case the extension was called weDownload Manager. Go to the Add/Remove programs dialog, and uninstall the software. Verify that the Nav-Links are gone. Please let me and the other readers know which extension opened the Nav-Links on your machine. I’ve added the Google Authorship Markup to the blog this morning. I wonder how long it takes before the rich snippets start appearing in the search results. Update October 26, 2013: Yeay, the rich snippets have now started to appear in the search results, at least on the start page of the blog. Just wanted to let you know that I’ve just released FreeFixer v1.07. I’m currently running some final tests on FreeFixer v1.07, which hopefully will be released later on today. 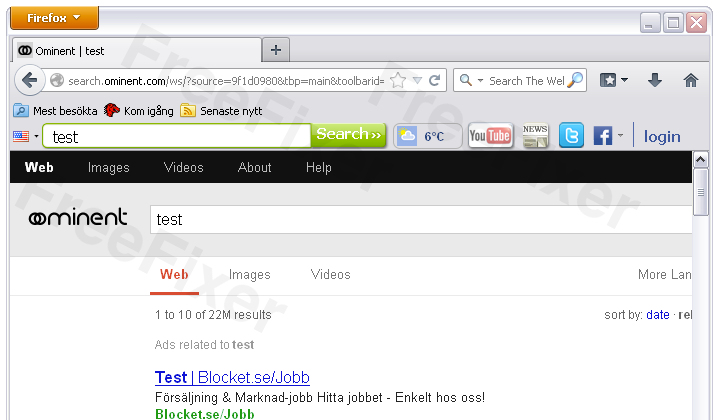 During my testing SnapDo/Smartbar did not install into Internet Explorer. 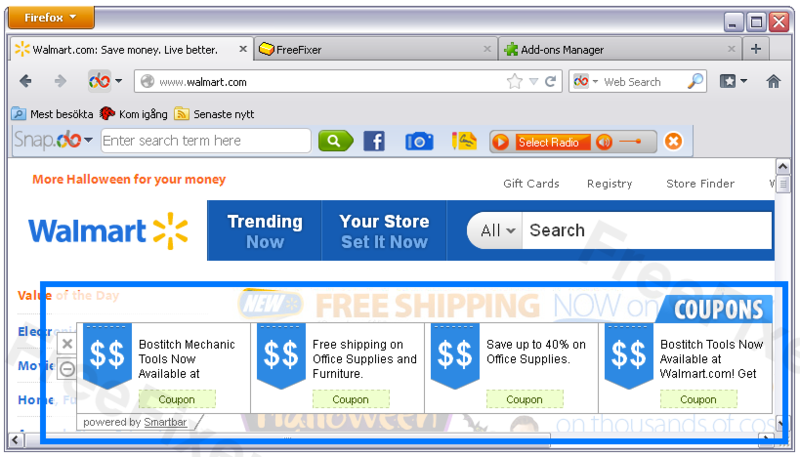 Do you get the “Powered by SmartBar” ads in Internet Explorer? Please let me know if this post helped you remove the Smartbar, or if you need more information. One last post today. I just tested “Swift Browse”, which is a variant of the WebCake adware. Unfortunately I could not trigger the Swift Browse ads to show themselves, which they usually do when visiting sites such as amazon.com. They will most likely look like the WebCake ads. 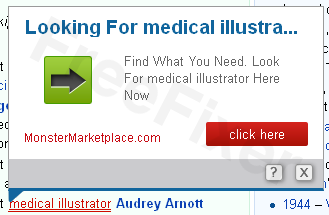 If you see these ads on your machine, please send me a screenshot and I’ll add it to this blog post. 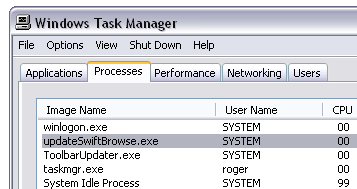 Anyway, if you have Swift Browse installed, you’ll see updateSwiftBrowse.exe in the Windows Task Manager, and swiftbrowsebho.dll installed as a Browser Helper Object in Internet Explorer. Ran into a new Toolbar called Ominent today. It was installed into Firefox, bundled with a free download. Address bar searches were replaced by http://search.ominent.com. If you came here looking for uninstall instructions, you are in luck: It’s easy. 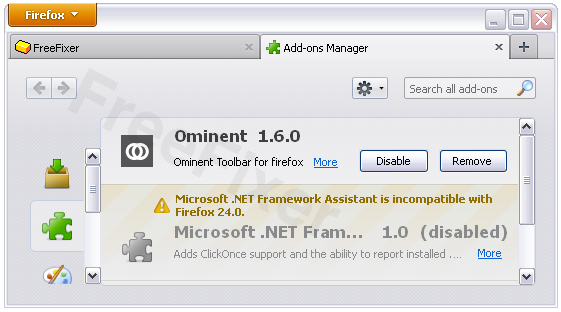 You can uninstall it from the Add/Remove programs dialog and in Firefox’s Add-ons dialog. Check out the screenshots below. By the way, it surprised me that Ominent Toolbar didn’t appear in Chrome or Internet Explorer. Did you also only get it in Firefox? Here’s a demonstration video on how to remove the Doko Toolbar with FreeFixer. Doko Toolbar appears to be a new variant of the Babylon Toolbar. 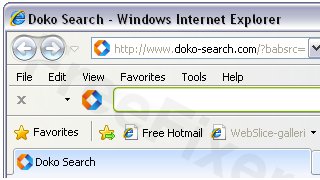 Doko Toolbar was bundled with a free download manager. In the video I check the following files for removal: dokotoolbar.dll, dokotoolbarTlbr.dll, dokotoolbarApp.dll and dokotoolbarEng.dll. I also select BitGuard.exe and BitGuard.dll for removal. Internet Explorer’s Start Page settings is also selected to be repaired, since it was set to doko-search.com. Here’s the video. Please let me know if have some questions about FreeFixer or the Doko Toolbar. Anyone else spotted these ads too?